I decided last night to join the 4:30am Neuston net team and the 5:00am Conductivity-Temperature-Depth rosetta deployment. These are gangly-looking devices the size of a go-kart and a Madrid street recycling bin, respectively. My sea legs weren’t that great yesterday. I wobbled a lot and hit the wall sometimes while walking down corridors. My stomach, luckily, is doing much better–no problems at all and I sleep like a brick. There are 6 research groups with experiments onboard, each operated by a team of 4-5 scientists, I think a total of 29 scientists including grad students, 4 permanent technicians, 4 journalists, 57 sailors. My bunkmate is a master’s student at the U. of Vigo, in Galicia, and has studied at A Coruña and in Santiago. He’s a year or two older, and spent some time as a technician. He also did an earlier leg of the expedition so he knows his way around the ship and the team and the routine. The ship, which I still haven’t fully explored, has a couple levels with labs and computers close to the waterline. Also kitchen with two dining rooms, gym, sailors’ bunks. Next level up is scientists’ quarters, where I’m housed, and a big lounge/conference room in the middle of the scientists’ bunks. Up one more is officers’ housing and a helicopter deck, though sadly no helicopter. Next is a level with an office where two TV guys work and probably other stuff I don’t know about. Top is the bridge. One of the video guys will be here for the entire expedition, 7 months. His assistant just joined, to replace the chief of their production company, who was here for the previous legs. They have contracts with a couple of Spanish tv channels and with CSIC, the research council, but even with that they’re not sure they’ll pay their bills, so they’re still trying flog more stuff. I feel like less of a chump for betting on this if they did, too, and in a bigger way. Apparently this guy has worked with Discovery Channel and National Geographic. I ought to learn a thing or three from watching them work and chatting with them. A big thing they’ve done is embedded themselves socially: everyone on the boat knows them and they’ve got the run of the place. Something I’m still new at navigating. The other journo is a political editor for El Periodico, one of the big Catalan dailies. His paper decided to send him as a complete science novice to get a naive look at the expedition. He has to file a lot more often than me and he has a broader purview: spent a lot of time on the bridge, for instance, reporting on the sailors, and a narrower audience: Catalans. Will be interesting to compare what we each write about. 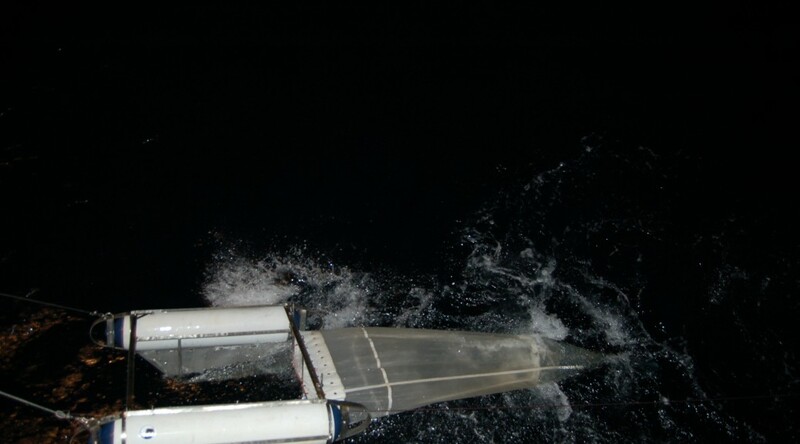 It was black out when I came down to the deck to sea the skate and CTD deployment. The light was yellow from the shipboard lights and a lot of the ship is painted red-orange. Weird combination of colors, or maybe it was just the hour. The skate was already in the sea, trailing just off the starboard side near the stern. 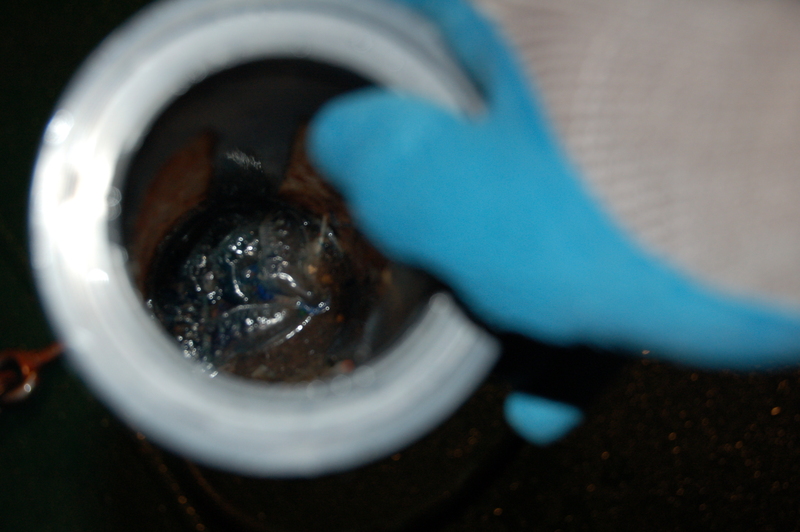 When the team of two sailors, two winch operators, and a scientist brought it in, the capture tube had a sludge of pinky-sized jellyfish and fly-sized plankton and other critters I can’t identify. They swiftly separated things for jarring and storage in the lab. The other gadget, the CTD as they call it, gets lowered to 4000 meters below sea level. Right now (this note first drafted around 6am, revised & posted around 11pm), a few scientists are watching a computer monitor in case something screws up. Mostly waiting: eating sandwiches, chatting, talking about the rest of the days’ schedule. The gadget takes two hours to drop and more to come back up, I think.Then they process data. The next observation isn’t until 8am or so. I can’t decide whether to nap now or just pull through until lunch and take a break then. Anyway, I’m going to have plenty to keep me busy these first few days as I learn the routine. After that, I have the luxury of going back to any observations I want to better understand or photograph or record and get the reporting right, since everything repeats here. It’s a particularly zen, or sisyphean, reporting trip. As for satellite communications: they tell me we switch from SpainSat, which seems a bit like a 3G connection, to something else, more of an old-school sat connection, sometime early to midway through next week. Until then, free calls to Spanish numbers and cheap ones abroad. After that, they say calls get very expensive and email less reliable, but everyone seems to be operating on the premise that there will be connectivity, just a little less convenient. The last few days into Perth supposedly has no coverage on the science satellite, but the military guys have a backup called Inmarsat which might be available for certain things. They also have an Iridium handheld (what I used in Kyrgyzstan). Amazing how many different systems they have to juggle. I thought trading SIM cards in my mobile phone when I fly between the US, UK, and Spain was a drag. Ok, back to filling up my notebook. I don’t think I brought enough. I hope I can steal paper from someone onboard.